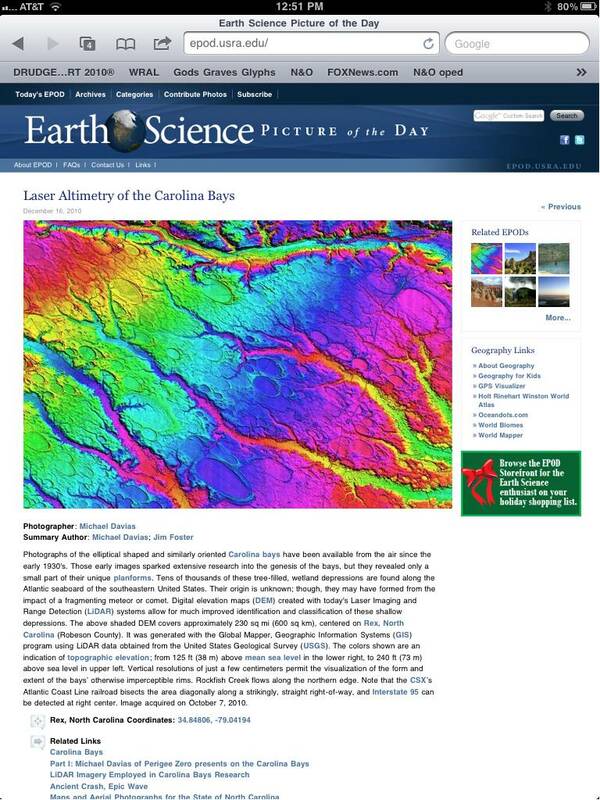 Mike Davias brought some attention today to one of the Tusk’s favorite subjects: Carolina Bays. 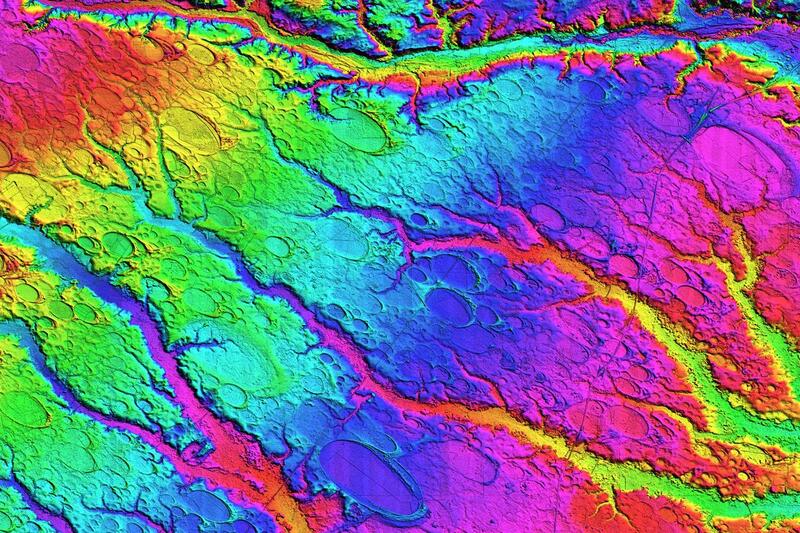 His wonderful LIDAR image of the bays — above and first revealed here on the Tusk — was selected as today’s Goddard Space Flight Center Earth Science Picture of the Day. Applause! These enigmatic features have long puzzled me, along with every other sentient being who has bothered to take a close look at them. While not surely created simultaneously from above, the bays still manage to defy conventional explanations despite many tortured efforts to explain them away. The contention that these features are nothing more than ghosts of old lakes is ridiculous. I have worked very, very intimately with these lands — and these suckers are not simply old ponds. For one, our team cored a bay in this photo. “Howard Bay,” as it were. Howard Bay was never a lake. All the way to the bottom throughout the feature there is not one scintilla of organic material. All pure sand. How could it be that a lake once existed there but no lucustrine evidence remains? (I’ll dig up some of the old data and post later). Furthermore, the standing explanation, elucidated by Dr. Andrew Ivester (before returning to work in his father’s auto parts business) does not stand to reason. Ivester claims the bays were simple lakes formed on-again off-again through the recent ice-ages. How the hell then did the bays retain their symmetrical organization through these distinct climatic ages? Would we not see some genetic and temporal relationship between bays of one age versus those formed in another? How exactly did winds conspire to form bays of the same alignment from one age to the next? There are problems with a simultaneous creation mechanism as well. With the exception of nanodiamonds galore, there is little evidence of a cosmic interaction. If something did happen suddenly, it was of a nature we do not yet fully understand. But waving off the ET hypothesis with an admonishment that all is known — and there is nothing here to see — is simply not an option for the Tusk. I wish Davias and many others well in their effort to unlock the truth. And I look forward to sharing every twist and turn with you here. Brazoria Women: Victim of the Younger Dryas Event?